Ha Na’s fired stun gun takes out the power in the club, causing chaos. Trying to escape, the men pull the fire alarm causing wide spread panic made worse by the fact the doors to the club were locked to prevent the criminals from escaping. Jin Hyuk goes after Joo Soo Young after checking to see if the female agent was okay. He tells them not to unlock the doors as the criminals pulled the fire alarm to escape, but the other agents had no choice but to do so in order to keep the public relatively unharmed. While Jin Hyuk pursues Joo Soo Young, Ha Na finds her mom and manages to sneak out of the club. They get spotted by an agent, but Ha Na pretends to arrest her mother as a criminal in order to forgo suspicion, upsetting her mom, but letting them off the hook. Jin Hyuk follows Joo Soo Young to the parking garage. He calls in for the backup to stop his car. An accident occurs and the car is surrounded, but Joo Soo Young is no where to be found. 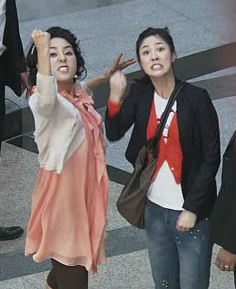 Ha Na has a nightmare that she is implicated in a terrorist plot due to prints left behind at the scene. When she wakes up, she asks her mother if any news about the raid on television reported her name. Her mom says no, making Ha Na feel temporarily relieved. Ha Na then states that she will of course find a way to get the money back as they desperately need the money. She then asks her mom about what happens if her fingerprints are found. Her mom said that with all the people coming in and out, fingerprints are basically useless and when Ha Na worries about being caught on surveillance cameras her mom tells her not to worry as she doesn’t have a face that is memorable. Ouch. Soo Ja then says she worries about being a burden to her daughter and Ha Na replies that she just wants/needs her mom by her side. Feel the familial love. Jin Hyuk is at the hospital waiting on news of Agent Park Se Mi. Joon Min comes out and tells Jin Hyuk that she is fine – only a few scratches and a mild concussion. Their boss then comes up and kicks Jin Hyuk in the shin for the solo stunt he pulled at the club. Jin Hyuk asked how the crowd fared and was glad to hear there were only minor injuries, nothing serious. The NIS’s big problem now lies with the media who was all over the incident and even went to the hospital. Joo Soo Young is at the horse races and ends up losing. He then tells his man to have the useless horse taken care of. No, he is not referring to the race horse on the track, but rather the man Jin Hyuk arrested in the first episode who is now in prison. Soo Young does not want the man giving out any more information and orders him to be silenced. Not too surprising, but I would have expected Soo Young to put the hit out earlier on the man. In a nice twist of situational irony/foreshadowing, we see the man in prison playing a game on his cell phone. He loses and says game over as the man sent to kill him enters the prison. Game over indeed. Jin Hyuk wants to take responsibility for the failed mission but Chief Shin Ki Joon says that Jin Hyuk doesn’t have the ability to accept responsibility and he goes and faces the angry Deputy Manager Lee all alone. Chief Shin says he is unhappy that he received orders to take Team 1 off the investigation as they have worked hard, sacrificed sleep, and ate only cup noodles for a month straight. Lee throws down the paper saying that their supposed effort did not support what little results they managed to achieve. Lee says Shin should know better that results are all that count. Lee then storms out of his office where he is followed around by Jin Hyuk and Shin, angering him. Shin says they will follow until they clear their reputations, but to no avail. 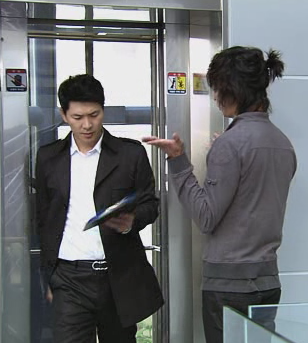 Jin Hyuk gets ready to leave, but Joon Min stops him saying he has the list of testimonies. Jin Hyuk was still going to leave, but did come back to look at them and Joon Min tells about how they mentioned a female police officer who apparently let the cat out of the bag. Ha Na goes into the police office to see if the NIS called in about her at all. The other officers report that they hadn’t and the chief there worries that Ha Na did something stupid before her review. Ha Na denies this vehemently and secretly puts back the stun gun and handcuffs that she “borrowed” the night before. Ha Na then takes off. Meanwhile, Jin Hyuk and Joon Min find out that their connection to Soo Young is dead, probably of foul play, but they have to wait for toxicology to come back first. They then head off to investigate the security cameras to see if they can find anything suspicious from the club. They then happen to see Ha Na talking to Geun Bae just before everything went south. As they are about to investigate further, Team 2 barges in and says they are now in control of the investigation. Ha Na is standing outside the bank, watching her ex and gathering up courage to go inside when Choi Chil Hyun comes out. Oddly enough, the loan shark puts his money in the bank for safe keeping. Who’d’ve thunk it? Ha Na asks if he knows where Geun Bae is, but Choi refuses to talk as talking gets a person in trouble, he then scolds Ha Na for not telling him she’s getting married, shocking Ha Na. Apparently her boyfriend is engaged! Then Choi recalls that it’s to the daughter of a wealthy woman, so it couldn’t be Ha Na after all – she got played. Poor Ha Na, nothing is going right for the girl. Jin Hyuk is grappling with Shin, trying to get control of the investigation again. Apparently he even went to Lee’s house, but nothing worked. Shin tells him to let go, but Jin Hyuk refuses. Then Shin gives Jin Hyuk some news that might help put him back in the investigation. Meanwhile, Ha Na goes back to the police station where she is caught requesting phone records. Her boss scolds her, but after she says they are her cheating ex’s records, he lets her have them. She finds the number he called most often and learns that he had been dating this girl (who also works at the bank) for over 200 days! And Ha Na had dated him for 2 years. Ouch. Ha Na finds out where the engagement party is to take place and begins concocting a plan. While Ha Na is digging up dirt on her ex, Jin Hyuk goes to his mom for a favor. Something he didn’t really want to do. In return, he will have to do something in exchange for his mother. Typical. Apparently, Jin Hyuk needed his mom’s invitation to a gathering that Lee would be at as well. Besides Lee, there were other bigwigs there. Thus, Jin Hyuk uses his mom’s and (late?) father’s connections to try to entrust he gets back in on the investigation. Funny moment. When a police general rubs Lee’s nose in the failed operation, she goes much easier on Jin Hyuk when she finds out who his father is. Priceless. And wouldn’t you know? Ha Na’s ex’s engagement party is in the same building! Her ex sees her and wants to know if she will cause a scene. Ha Na says not during the engagement, she’s waiting for the wedding. While her ex and his fiancee greet their guests, her ex keeps looking over and giving Ha Na a death glare while she sits on the steps, eating and drinking, observing everything. Her ex then calls over security. Ha Na does her best to escape. As she does, she runs into Jin Hyuk who was leaving the party after getting what he wanted (he has one month to complete the investigation or resign). Seeing the big scene and needing to talk to Ha Na about what happened at the club, he begins pursuing her, finally cuffing her and throwing her in his van with her ex and his fiancee watching the entire ordeal. Jin Hyuk then brings in Ha Na and her mother. They are interrogated while Joon Min and Se Mi search the Oh house. Nothing is turned up in the interrogation, bank account investigation, nor house search. The higher ups are furious at how little there is to report. Jin Hyuk just can’t bring himself to believe that everything is mere coincidence. Ha Na asks what day it is (apparently they’ve been there for 2-3 days already. She says she needs to leave in order to go to the hearing so she can save her job. Jin Hyuk refuses to let her go. He gives her a lie detector test, and accept for lying about seeing Geun Bae before the night club, she passed with flying colors. Not having any evidence against them, Ha Na and her mom are released – too late for Ha Na to defend herself to the committee. Ha Na finally manages to get the information of Geun Bae’s whereabouts from Choi by promising him a finder’s fee. She goes to the address provided and manages to grab Geun Bae. Just as she is about to get her money back, Jin Hyuk finds her and Geun Bae together. And thus the episode ends. My thoughts: You can’t blame Jin Hyuk for not believing in coincidence, because “coincidence” is usually planned out in many cases, but it is the truth nonetheless. Ha Na is a very interesting character. Tough as nails, annoying, but sincerely not a bad person, just misunderstood. Her mother and the debt she faces is what makes her the way she is. she wouldn’t care so much about money if she didn’t desperately need it. Can’t wait to see what happens next! And, Ryu Jin has finally been introduced as some hot young tycoon. What role will he play in this drama? Horan has yet to make her official appearance, but should be in shortly as Jin Hyuk’s first love.